Who knew that Vietnamese Honeycomb Cake (Banh Bo Nuong) would end up being one of the most difficult cakes I’ve ever tried to make? My friend gave me a delicious homemade Banh Bo Nuong around Christmas time, and I’ve been trying to duplicate it ever since. The more I failed, the more determined I was to get it right. My first (unsuccessful) attempt used this recipe I found on a blog – I followed the instructions to the letter (used the right kind of baking powder, didn’t overbeat the eggs, etc.) – but I ended up with a deflated, mushy, compact gelatinous brick. It also wasn’t sweet enough – blech! – the results went into the trash. For attempt #2, I thought, “Maybe the cake doesn’t have enough gluten to provide structural support?” So I substitute cake flour for half of the tapioca flour, increased the sugar, and ended up with something that tasted more like a Pandan pound cake – good, but no honeycombs – and it definitely wasn’t Banh Bo Nuong. Attempt #3 utilized a combination of tapioca flour, rice flour, and a small amount of cake flour – I was hoping the rice flour would give a chewier texture and also help with the structure of the cake to prevent it from collapsing. Nope, wrong again! Cake #3 was good – but still was nothing more than a Pandan pound cake, and still did not resemble Banh Bo Nuong. There are several steps that must be strictly adhered to when making this cake: First, use only SINGLE-acting baking powder. Most American markets stock only DOUBLE-acting baking powder – which is great for banana bread – but will ruin your honeycomb cake. You can find little pink packets of Alsa brand (single-acting) baking powder at Asian markets. Or, make your own baking powder by combining cream of tartar and baking soda in a 2:1 ratio. My successful cakes #4 and #5 both used cream of tartar + baking soda, so I know that it works. Second, make sure you preheat your cake pan, greasing only the bottom. Leave the cake pan sides un-greased, to give the cake something to cling to for support. Angel food cake pans are great for this cake, as the center tube will give added support. If your cake lacks the honeycombs, it could be that your oven is not hot enough, or could be out of calibration – experiment with baking at 10 degree hotter temperatures until it works. Once baked, hang the cake upside-down on a rack to cool, if possible. This will help reduce the likelihood of your cake collapsing when cooling. Third, be careful not to beat any air into your batter. The trapped air will expand in the oven, causing the cake to rise… and the more air that is incorporated, the more the cake will deflate as it cools. Stir your ingredients slowly – resist the urge to use a beating or whipping motions. Tapioca starch and tapioca flour are the same thing – use either. You can find tapioca flour at an Asian market, or at a “Whole Foods” type of health food market. I bought my latest batch of tapioca starch at Sprouts Market, Bob’s Red Mill brand. Coconut cream is thick coconut milk. You can sometimes find coconut cream for sale in cans, like I did. Or, buy coconut milk, and do not shake or agitate – open the can, and use the thick layer of cream that has floated to the top of the can. 2. Sift the tapioca starch, baking powder, and salt. Do not use double acting baking powder, or this recipe will fail. 3. In a separate container, stir the eggs until homogenized – you want to avoid beating any air into the eggs. 4. Mix the coconut cream, sugar, pandan, and vanilla extracts. Stir until sugar is dissolved. 5. Stir the eggs into the coconut milk syrup. Do not beat or overly agitate the mixture. 6. Pour the wet ingredients on top of the dry ingredients, and mix to combine. Stop mixing when you still have some lumps – over mixing will ruin this cake. 7. Pour the batter through a sieve, and using the back of a rubber or silicone spatula, push all of the batter through. This step will take care of all the lumps, allowing a nice smooth batter, without over mixing. Sieve the batter 2 more times to ensure a perfectly smooth batter. 8. Pour the batter into the hot cake pan, and bake for 10 minutes at 360 degrees in a convection oven (375 degrees in a normal oven). After 10 minutes, reduce the heat to 305 degrees, and continue baking for 25-30 more minutes. Test with a wooden toothpick – when the toothpick comes out clean, the cake is ready. 9. Remove the cake from the oven, and invert onto a wire rack. Allow to hang upside down to cool for at least 90 minutes. 10. Remove the cake from the pan when cool, and serve. Note: You can also make a round version of this cake by baking in a cast iron dutch oven (oil only the bottom of the pan), at 365 degrees in a convection oven for 10 minutes (or 375 degrees in a regular oven), then another 30-35 minutes at 305 degrees. Hang upside down for several hours to cool. did you mean 350 Degrees. for clarification re oven temps. Yes, reducing the heat after 10 minutes to 305 degrees is correct (not 350). I know it sounds strange… but it seems to work for me. Starting high, then finishing low seems to keep the cake more stable, and allows the bubbles to set. Make sure you hang it upside-down to cool – this was the most important part for me to avoid the cake deflating. Hey the last time I attempted making banh bo nuong, it seem to be rising but as soon I take it out of the oven. It deflate. What would the problem be. I tried to stir slowly without whipping. Or is it the heat? Did you use my recipe and technique? You can’t just take it out of the oven and let it cool – it will deflate if you do that. You have to hang it upside down until totally cool to prevent the cake from collapsing. thanks very much for fast response! i got the cake in oven and just this second reduced heat to 305 degrees with high hopes cake will be okay. first time making this cake and the color of the batter is absolutely a gorgeous jade green! thanks again! You’re welcome! Good luck and I hope it turns out ok… it’s a tricky cake to make, but one of my favorites. This will be one of my favorites too! I love the color of the cake and it taste really good too! I have to try it again with a pan that doesn’t have a nonstick coating because when i flipped it upside down, the cake slowly fell onto the cooling rack. OMGoodness! I couldn’t stop laughing. I didn’t have a regular cake pan so used a nonstick pan. of course it’s gonna fall out. LOL. Anyway, the cake still looks great and tastes great even with my silly boo-boo. Thanks so much for sharing this recipe and your baking tips! ps. I just ordered a regular cake pan today so i can give this recipe a try again. I can’t wait! I’m glad it worked out for you! This cake gave me so much grief… I was so happy when I figured out how to make it. Any metal cake pan that you use to make an angel food cake usually works pretty well – like a removable bottom tube pan. I’ve also made a round version of this cake using a Lodge brand cast iron dutch oven – but be really careful not to grease the sides of the pan. I tried this receipe a couple of days ago. I’m wondering, if I have a regular oven should I continue to cook at 305 or increase temp a little more.I ended up leaving mine in for a additonal 10 minutes so a total of 40 mins after I lowered temperature to 305 in order to get it brown on the top. I tried making it, but when it rose it did not rise evenly like the picture you poste. One side was higher than the other. All in all, it tastes pretty darn yummy! Whether you are using a regular or convection oven, you should decrease the oven temperature to 305 after 10 minutes of baking at the higher temperature. The 25-30 minutes additional baking time at 305 is for an angel food pan (with the tube in the center) – if you are using a round cake pan, you will want to bake a little bit longer (about 30-35 minutes). Obviously, the time will not be exact – it depends on how hot your oven runs, and what type of pan you use. Do not open the oven at all during the initial baking period – only at the end to check done-ness. Multiple other recipes had me put in the whole package of asla brand single acting. I put only 2 1/2 tsp,should I put more for it to rise? I tried to have may sugar mixture to disolve, but it was still grainy texture like when adding it to the egg mixture? The whole packet of alsa baking powder is exactly 2 1/2 tsp, so if you only used a portion of one single packet… then you might be using the wrong spoon size. 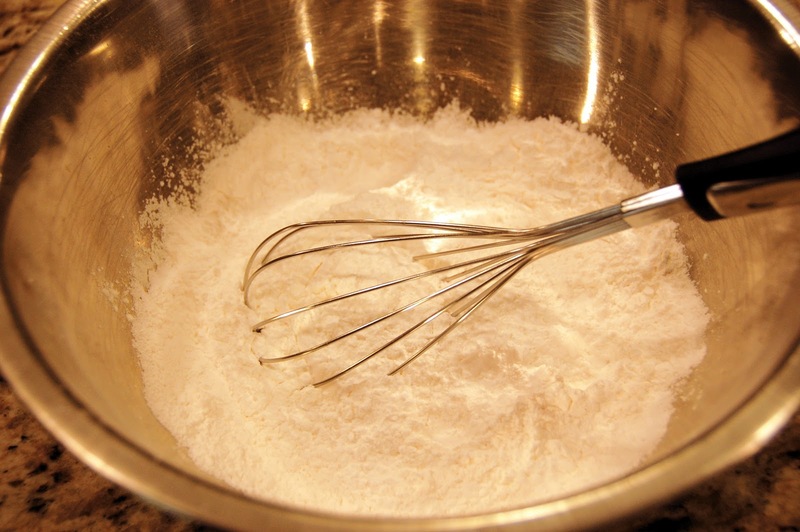 Make sure you are using actual measuring spoons to precisely portion out the leavening agents. Use an entire packet of single acting baking powder next time (which is 2 1/2 tsp), or use my substitution of 1 3/4 tsp cream of tartar + 3/4 tsp. baking soda. Adding too much baking powder to your recipe will not help in rising – it will actually cause your cake to fall flat and have a funny taste. As far as dissolving the sugar, no, the texture should not be grainy – if you are having a lot of trouble, you can heat up the coconut cream in the microwave to fully dissolve the sugar – but you want to make sure this mixture is 100% cool before you add it to the recipe or it will alter your result. Liz – I’m so glad to hear it turned out well! This is a tricky cake to make – but once you figure it out, it really isn’t so hard at all. When do we put the salt? Thanks for sharing ,but wonder if this recipe able to make it in microwave,the only i own. Have A Great Day And God Bless . I’m sorry, but I don’t think this recipe is suited for the microwave. Banh Bo Nuong is a very tricky cake to make… and can be temperamental if the oven heat is not just right. Plus, the best results come from using a preheated metal pan (so that the batter sizzles when you add it to the pan) – which is just not possible in the microwave. Just to let you know, there is no need for cornstarch. Tapioca flour is starchy enough and provides enormous chew. Cutting your coconut milk amount in half makes for a more dense cake, thus chewier. If you actually you use half rice flour and half tapioca flour, you will get a softer cake that still has plenty of bounce and honeycombs. 1 packet alsa or other single acting baking powder. As soon as all ingredients are mixed it’s best to bake it right away. Well, this recipe has never failed for me, give it a try if you like. Thanks for your recipe, Mike, I will give it a try next time! Hmm, sorry, I must’ve imagined reading cornstarch somewhere, forget that comment. Haha. Thank you for sharing. My mom has been trying to make this for years, and it has been unsuccessful. 1. Is it suppose to rise so much? Mine rises a lot that it started to overflow and covered the top of the cupcake pan. 2. Why the middle sank after it cools? I was very careful to not over mix it, and I thought it works when I saw it rises. I was disappointed when it sank after. One thing I would change about this recipe in the future is leaving out the vanilla. I taste the vanilla more than the pandan in this cake. I have never made this recipe in a cupcake or muffin pan. From what I have experienced, I don’t think this recipe is suited for cupcake/muffin tins, but if you find a way to make it work, please let me know. Generally when filling cupcake pans, you want to be careful not to overfill (I would only fill 1/3 full at the most if you would like to experiment). You would also need to alter your baking time. Again, I’m not sure why your middle is sinking. If you use a normal angel cake pan, or a cast iron dutch oven, and hang the cake upside down while cooling (as in the instructions above), it should not collapse. If you are finding the center collapsing, you may not have baked it long enough, may not have used the right pan, or maybe did not hang upside-down to cool? Assuming you used a cupcake pan, this is probably why it did not work. The vanilla extract adds depth of flavor to the pandan – you can add more or less pandan depending on how strong you would like it. But if you do not care for vanilla, by all means, leave it out! While I haven’t made this cake with muffin pan (would love to be able to bake it in individual size), I experienced the issue with a huge rise and later deflated. In my case the problem was the cake pan was not proportionate to the amount of batter. I was using the springform cake pan for the double recipe. It turned out that the outside baked so much faster while the inside is not set fast enough, thus the cake eventually collapsed. I suspect that you would had the same problem with the muffin pan, unless as Mika said, you should not fill the muffin too full. Good luck! Let us know how if you try again and how it turns out. Hi, how is it that you had quite a thick golden brown on the bottom/top/and even the sides? I made it and the top was just thinly browned, bottom&sides not brown. I have an electric toaster oven (w/ convection&regular setting), but I noticed that when i use convection, anything i bake takes much longer to be done. Is it possible to substitute the greased bottom with parchment paper, because my cake’s bottom was slightly wet. Also, for making our own baking powder by combining cream of tartar and baking soda in a 2:1 ratio, can I make in advance, for example 4 tsp cream of tartar + 2 tsp baking soda to save for use next time? Your recipe, make your own with 1 3/4 tsp. cream of tartar + 3/4 tsp. baking soda, is that in 2:1 ratio? I think the problem is that you are using a toaster oven. When you open the door to a toaster oven, it basically loses all its heat and takes a long time for the temperature to increase again. This cake is very temperamental, so it’s best to bake this cake in a large/normal oven (convection or regular). Make sure you preheat your cake pan in the oven so that it is nice and hot (and sizzles when you pour in the cake batter). I wouldn’t use parchment paper for this one. If your cake doesn’t brown, it probably means your oven is not hot enough. For the single acting baking powder substitution… No… it’s not quite a 2:1 ratio. It’s more like a 7:3 ratio. If you use 1 3/4 tsp. cream of tartar and 3/4 tsp. baking soda – that’s all you need for one cake. Hope this helps! so it’s the oven, hmmm. it does come out delicious and has all the bounce/honeycombs, just not browned all around, i’ll try increasing the temp when i make it again on friday and i’ll let you know how it goes. So thank you so much for sharing the secret tweaks to your success!! About eight minutes after popping it into the oven, I glanced through the door (without opening it!) and saw it was rising perfectly. At ten minutes when I went to reduce the heat, I saw that liquid batter from beneath the browning top – but on ONE SIDE ONLY – was leaking up and pouring around one half of the cake. It baked and turned out fine in the end but it made for an uneven cake. Any suggestions for fixing/preventing this? Secondly, I got the holes in the cake but not the long “bamboo roots” of the honeycomb texture. My dad pointed this out and said something about letting the batter sit for a couple hours to let the bubbles rise to the surface before baking it. Does this sound feasible to you? He’s indisputably more knowledged than me about Vietnamese food so I don’t want to question his logic, but as a baker, I know that mistakes go a long way in baking. What do you think? Regarding the uneven rise… your oven might not be circulating heat properly. Some ovens have hot spots and cold spots, which can adversely affect your cake. That’s why I’ve found the best success using a convection oven, since the heat flows evenly around the oven. If all else fails, rotating the pan would be my next best suggestion. As far as the holes… I don’t know? Give your dad’s suggestion a try – what can it hurt, right? Let me know if it works out. For me, I noticed that the sudden heat from a hot oven and already hot pan make the most difference in creating the bubbles/tunnels. Also, when I use a round cast iron dutch oven, I get the best honeycomb texture vs. an angel food or bundt cake type pan. Thank you for this recipe. I tried it on the first time and I did well. I was very happy! Yay! I’m so happy it worked for you!!! Thank you for the recipe. I love coconut cream so I used 1 cup. Also I prepaed my own pandan extract as I don’t like artificial food coloring and flavor. It turned out successful. The ‘re tre’ or tunnel appearance was evident. Also the cake rose evenly. I suggest to turn the pan 180 degree around when reducing the heat so that it can rise evenly. Next time I will reduce the amount of sugar to 1 cup as it was a tad too sweet. The recipe from Uyen Thi on YouTube was bad. She got the whole thing wrong. I’m glad it worked out for you! You certainly can reduce the sugar a bit… I like it a little bit sweeter… but I probably wouldn’t reduce the sugar more than 1/2 c. less than the recipe calls for. Thank you for sharing your recipe. My first attempt baking this yummy cake didn’t succeed. I was wondering, if it’s okay to use 1 c of coconut cream? I don’t think you should change the ratio of any of the ingredients. If you add extra coconut cream, you will probably throw off the balance of the recipe… I wouldn’t try this unless you have made this cake numerous times and are familiar with cake baking in general, and this specific cake in general. I’ve had very good success by following my recipe to a “T” – did you change anything or omit any steps? You need to make sure you follow ALL the instructions exactly as written, or you will find that your cake fails. This is a very finicky recipe, and changing any step – even slightly – may cause problems. Make sure you are using SINGLE acting baking powder and coconut CREAM (not coconut milk). Also make sure you strain your batter THREE times, and preheat the pan (greasing ONLY the bottom). Do not beat the eggs or the batter, stir slowly, and do not over-mix. Once the cake is done, you cannot just allow it to cool… you MUST continue to follow the instructions and HANG THE CAKE UPSIDE-DOWN IN THE PAN to cool (completely). You need to make sure that you follow ALL of these steps – they are ALL very important. I can help you troubleshoot if you tell me exactly what didn’t work out for you, and what you specifically did. If I use a regular oven 375 shouldn’t I add 15 degrees to the 305 after 10 mins? No, it is not necessary to add 15 degrees to the temperature after 10 minutes. Whether you are using a convection oven or a regular oven, after 10 minutes turn the heat down to 305 degrees (WITHOUT OPENING THE OVEN DOOR). You want the initial oven heat (and the pan) to be hot enough to form the bubbles/tunnels… but after those bubbles are already formed, the lower heat is just to set the cake. Thank you!! You’re awesome….I have try 3 difference reciepe and failed, plan to give up than I find you. The cake come out perfect and taste good too. Just wonder can I use only the panda extract? Yay! Glad I could help. If you are thinking of making other flavors, you don’t have to use pandan extract… you could also use vanilla extract instead. You’re welcome! I’m always glad to hear when things work out! Good luck! Just make sure you follow all the directions, and you should be fine! When we mix the eggs, 1. Do we leave the yolk inside also?,and 2. Do we mix it carefully and not beat it so hard? What will happen??? Yes, use whole eggs. Do not beat the batter or the eggs – you want to avoid creating air bubbles which will expand rapidly when the cake is baking, then deflate immediately upon cooling. Do we really have to let the cake cool for 90 MINUTES!?!?!? Yes, make sure you cool the cake completely (upside down!). This will help the structure of the cake “set” so that it doesn’t collapse during the cooling phase. All of your recipes, including: banh bo nuong, banh khoai mi nuong, and banh da lon are very very GOOD!!! I tried them all and always got the FANTASTIC RESULTS. Many thanks. Yay I’m so glad you like them! For some reason my cake have a strong egg aroma, is there anything I could do to eliminate that?? When the cake is hot (because this type of cake usually contains so many eggs) it is normal to somewhat smell the egg. However, as the cake cools, the egg scent should reduce quite a bit. the 305 degree is for both convection and convention oven or just for the convection oven only? Never mind about my 305 degree question (same for convention and convection oven). I see that you already answer in the previous post. Does the cake rise much after it done baking. Your picture show the cake rise rather high with the tube pan but the thickness of my cake only about the size of your last bottom picture. Is it possible to double the recipe and bake in the same pan ( a little bit longer time?) I like my cake to be thicker in size. Also, I use an aluminum tube pan , grease only the bottom , but once I invert the cake to let it cool, ( less than 90 min) the cake automatically fall off the pan onto the rack . ( although it doesn’t deflate, yet). Do you think it will affect the texture? The cake will actually shrink back somewhat when cooling (after baking). If you use a tube pan, you will get a higher cake – because there is more structure and support. I wouldn’t double the recipe – if you do, you are likely to have a collapse – and for some reason, this type of cake is very finicky to make – the recipe does not accommodate for changes very well. If you have a non-stick tube pan, that could be part of the problem – if the cake doesn’t “stick” to the sides of the pan, then it probably will fall out during the upside down cooling step. If that’s the case, you might have a flatter cake – but you won’t know until you cut into it if the texture is affected or not. I guess it depends on your particular pan. I will normally soak the pan in hot soapy water for 1 hour, then use a sponge to wipe up the loosened crumbs. The tip of a plastic knife can help scrape out any residue from crevices (don’t use metal or you will scratch your pan). Sometimes soaking with hot water and a few spoons of baking soda can help loosen up burnt stuck on parts. This is my absolute favorite Vietnamese cake and I am excited to try it out. Thank you for your trial and error and making it super easy for the rest of us to follow! Where can I get pandan extract? Do you know if I can make my own pandan extract with pandan leaves and water instead of using commercial extract ? If yes, what would be the quantity of homemade “pandan water” to use for this recipe ? I guess it won’t be 1/2-1 tsp as it will be less concentrate than pandan extract. You probably can… but you have to be careful not to introduce too much liquid into the recipe, as it is very finicky and it could cause problems. If you make a strong Pandan water, maybe simmer it for awhile to reduce it to make it even more concentrated so that you can just use 1 tsp. ?